Norland trained nanny looking for ad-hoc work and babysitting. 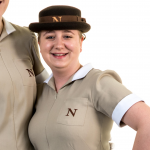 I studied at Norland College achieving a First Class Degree in BA (Hons) in Early Years Development and Learning, as well as studied for the Norland Diploma, including modules in Care and Wellbeing of children and families, Food and Nutrition and Sewing. Before Norland I achieved a CACHE Diploma Level 3 in Childcare and Education. I currently hold 12 hour Paediatric First Aid training (May 2017) and an enhanced DBS (March 2017) which is registered on the update service. I am a confident, caring, patient and trustworthy nanny with a range of experience working with children aged 0-16 years, including a mixture of sole charge and shared care and live in and live out. I am passionate about working with young children, and my fun and creative nature means that children in my care enjoy a range of activities and experiences that are entertaining, engaging and promote development. My adaptable nature means that I am able to work easily in many situations, and think on my feet if necessary. I enjoy cooking and baking both for and with children in my care, and also have experience of cooking for children with allergies and intolerances, as well as fussy eaters. I also have experience of weaning from the very beginning. I have experience of driving with children (including driving in London and abroad), as well as using public transport. I have experience of travelling with families, including supporting families on flights. I have learnt British Sign Language, which is useful for children with hearing difficulties, children with additional needs and also babies as baby sign. My extensive range of experience includes working with children from newborn to 16 years old, including plenty of newborn experience, multiples, and working with children with additional needs. My previous role was a full time, live in, sole charge nanny in London with two boys, ages 4 years old and 11 months old (3 months when I started). - Holiday Nanny with a family with a 5 year old girl, 3 year old boy and 14 week old girl in the Hamptons, New York. - After school nanny for a 5 year old girl. -Holiday nanny with 9 year old and 5 year old triplets (mixture of sole and shared care). -Temporary nanny for a 5 year old and 2 year old (sole charge). I have also completed various work placements throughout my training, working with many families (including twins under 1 year) and working with new mums and their babies on the local maternity ward. CACHE Level 3 Diploma in Childcare and Education. Paediatric First Aid (12 hour) (May 2017). Will depend on the role. Below are the latest reviews for Nicola. Please note that reviews represent the subjective opinions of other Childcare.co.uk users and not of Childcare.co.uk. Parents must carry out their own checks and references on childcare providers to ensure that they are completely happy before enaging in the use of their services. We asked Nicola to assist as a mother's help and nanny for our 8 month old twins, for a period of 6 weeks 2-3 days a week. She also assisted with our elder son in the evenings. We found her to assist as required and was good in what we what we needed and acheived jobs to a high degree. Tasks included sole charge, walks in their pram, identifying/attending classes, bath time, feeding, cleaning up and often she would go beyond what was required and took on extra jobs. She was very flexible with times and days, and with more experience ovet time her confidence will grow. Nicola was thrown into the deep end when she met us and handled it brilliantly. She is very reliable, helpful, responsible and organised and comes with a lot of experience. We always know our son is in good hands and don't have to worry about a thing. He took to her immediately. She gets on with things without us having to ask her to help. She was also extremely helpful when she couldn't babysit for us and found us someone who she trusts and knows can do the job well. I would recommend Nicola if you want a responsible but fun nanny. We couldn't recommend Nicola more highly as a babysitter! She was responsible, well organised, flexible with our required timings and easy to get in touch with at all times. Our 8 month old son really enjoyed his time with her. We were very impressed with Nicola's skill set and knowledge about young children - she even brought some developmental toys for our baby to play with, which was a big success. She is one of the first babysitters we have used while travelling for work and we only wished she lived closer! Nicola arrived with us to provide a couple of weeks' cover over the summer holidays. She was thrown straight in to the deep end and took everything in her stride. She is lovely with the kids and they immediately took to her. She is very conscientious and responsible and we would have Nicola back again to help us any time.